Less than three decades ago, full load kW/ton was still a widely used metric of chiller efficiency. It was only in the late 1980s that stakeholders in the industry realized that this indication was incomplete because full load conditions are rare in real life situations. That was the beginning of better and fairer comparison metric. Specifically, it marked the arrival of Integrated Part Load Value, better known as IPLV. Through updates to this standard, we now have NPLV as one of the recent performance characteristics under the Air-Conditioning, Heating and Refrigeration Institute (AHRI) banner. While applauding the remarkable achievements of AHRI, ARANER is now going beyond with the aim of capturing the performance of a complete plant, as opposed to restricting itself to chiller analysis results. Have you heard about the company’s highly reliable cooling load profile simulation? A cooling load profile simulation is an important asset in order to optimize the design of the cooling plant and TES Tank. However, the industry is facing a major challenge. It is very complex to calculate the cooling demand and the plant performance for thousands of different ambient conditions. This is in the sense that the cooling plant configuration and its performance is optimized only for design conditions; which usually they are the most severe conditions around the year. However, only a few days during the year the plant is working as per the design conditions; and most of the time is working at partial load and with lower ambient temperatures. Sometimes, an educated guess is done through the NPLV calculation, which evaluates the chiller performance at 4 different points and then uses 4 factors to extend the results to a complete year. However, this is technic differs from a complete modeling of the system. It is fulfilling to note that many District Cooling plants across the globe are realizing the importance of modeling for the complete cooling plant performance. They are also recognizing that modeling influences critical design decisions, for example lighting and orientation of windows. When sizing a District Cooling plant, cooling load calculations play a critical role. With ARANER’s conscientious and experienced professionals, you can be sure of getting a District Cooling system that will serve you perfectly for many years. ARANER opts to use the more strenuous and reliable complex simulation method. We chose it because its high accuracy helps predict the energy performance of a District Cooling system with minimal errors. Unlike our competitors, our reference data is not from a particular hour of the day. We recognize that the cooling equipment may not operate at maximum capacity throughout the day, leave alone the month or year. That is why we use powerful computer software to determine the ideal cooling load profile. Instead of picking one hour per day, we consider real weather data hour-by-hour for a complete year. This means that the cooling demand and the cooling plant performance is calculated for 8,760 different points. Enter weather data and project requirements into the software. Use tool to generate a detailed cooling load profile. Base loads- computer rooms, telecom closets, etc. It is clear, therefore, that this profile simulation leans towards a clearer picture of a complete cooling plant performance. Stakeholders and designers have the noble duty of making tradeoffs between different design objectives. For the best results in District Cooling design and decision-making process, a detailed cooling load profile simulation is essential. Some companies use rule-of-the-thumb Cooling Load Profile Simulation techniques, rather than going the full length and getting all the details. Only Detailed Cooling Load Profile calculations can guarantee that the resulting District Cooling system is optimally energy efficient, comfortable and satisfactory. 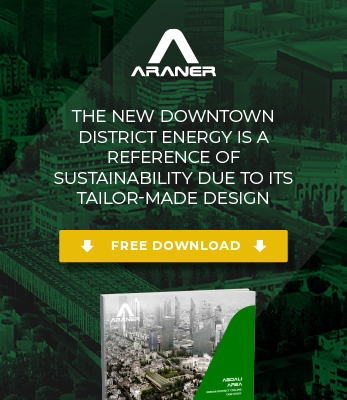 ARANER would be pleased to share more about this simulation for better performance of your District Cooling plant. Contact our representative today.